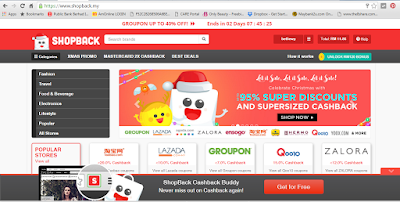 Attractive Shopping Online, More Discount and More Cashback When Sign Up With Shopback. You can enjoy shopping online and at the same time earn cashback with ShopBack. Do you love this type of reward? Doe this attract your attention? I found ShopBack when I google online as I looking for one stop website that can provide everything that I need for example booking hotel, shop online, ordering food or even purchase electrical items. ShopBack is a cashback and coupon online shopping site where you literally get cash back when you click through to the partner merchants from our site. On top of existing discounts and voucher codes, you will enjoy certain percentage of cashback on what you have spend. Choose the item that you wish to purchase and proceed with payment. Once payment done, your cashback will credit into your ShopBack account, which can later be cashed out into your bank account or PayPal for real cash. How to register as ShopBack member? 2) You will redirect to below page. 3) Key in your email address and create your own password . Once done, click sign up. For first timer sign up, RM 7 will be credited into your account. Wow, you earn RM 7 easily for sign up with Shopback. AliExpress is one of the frequent website that I love to shop with. I get 6% cashback when I shop with AliExpress . Get the best AliExpress coupons now. More website that you can shop with. 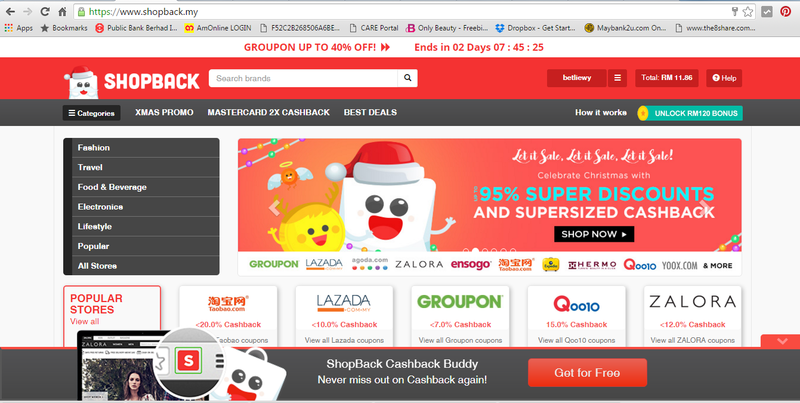 If you shop with Groupon, you get up to 7% cashback, while book your hotel with agoda.com, you can get up to RM 40 Cashback. Easy to shop online and attractive cashback from ShopBack. ShopBack not only established in Malaysia, Singapore, Philippines and Indonesia, but are expanding to the rest of South East Asia soon. Sign Up now and enjoy the latest New Year promotions. More information, log into https://www.shopback.my or visit their Facebook at https://www.facebook.com/shopback . Happy shopping and grab the attractive discount brought to you by Shopback.